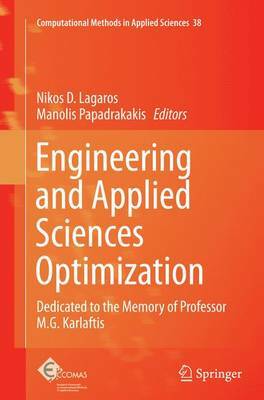 The chapters which appear in this volume are selected studies presented at the First International Conference on Engineering and Applied Sciences Optimization (OPT-i), Kos, Greece, 4-6 June 2014 and works written by friends, former colleagues and students of the late Professor M. G. Karlaftis; all in the area of optimization that he loved and published so much in himself. The subject areas represented here range from structural optimization, logistics, transportation, traffic and telecommunication networks to operational research, metaheuristics, multidisciplinary and multiphysics design optimization, etc. This volume is dedicated to the life and the memory of Professor Matthew G. Karlaftis, who passed away a few hours before he was to give the opening speech at OPT-i. All contributions reflect the warmth and genuine friendship which he enjoyed from his associates and show how much his scientific contribution has been appreciated. He will be greatly missed and it is hoped that this volume will be received as a suitable memorial to his life and achievements.